This month heralded some good news: Australia leads the world on sustainability in the property sector, according to the Global Real Estate Sustainability Benchmark. 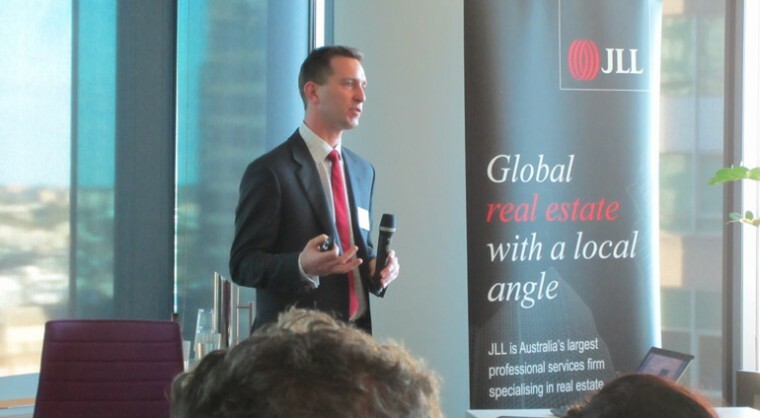 Last week, at JLL’s offices in Sydney, Ruben Langbroek, GRESB head of Asia Pacific, presented the results of the survey. For the fourth year running, Australian properties were ranked most sustainable, beating Europe, Asia and North America. Australia was leader in all categories, including management, policy and disclosure, risks and opportunities, monitoring and EMS, performance indicators, building certifications, stakeholder engagement, and new construction and major renovations. Other good news included Lend Lease’s APPF Commercial Office portfolio, managed by JLL, taking out top honours as global leader of all respondents. Australia, however, lagged the rest of the world in one sub-category, green building certifications covering the operational phase. The recently launched Green Star Performance tool, as well as wider take-up of NABERS, could help Australia to improve in this area, the report said. Asia, too, was threatening Australia’s leadership in green certification overall, with Singapore having a mandatory requirement since 2008 for all new developments and major refurbishments to use the Singapore Building and Construction Authority’s Green Mark standard. 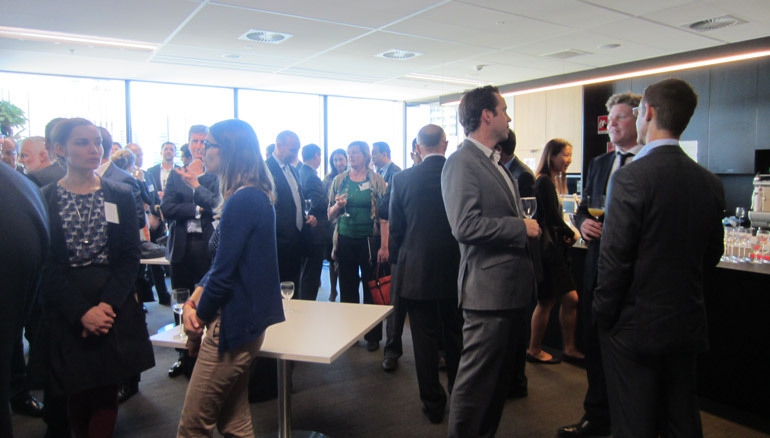 In Australia Green Star remains voluntary, while NABERS is only mandatory for larger commercial office buildings. 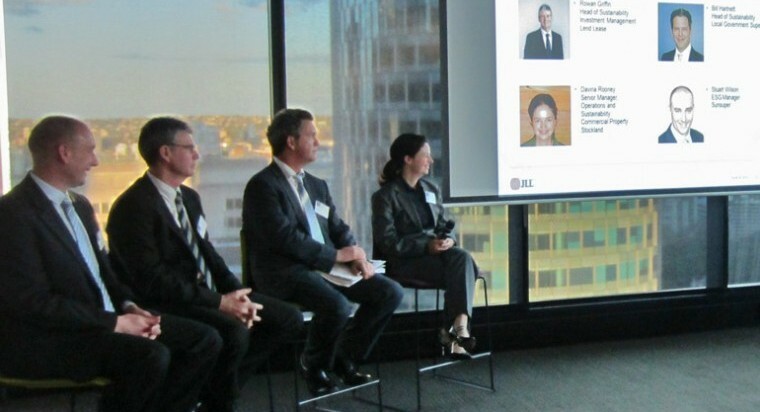 There was a panel discussion on the results, featuring Rowan Griffin, Lend Lease head of sustainability-investment management; Bill Hartnett, Local Government Super head of sustainability; Davina Rooney, Stockland senior manager, operations and sustainability; and Stuart Wilson, Sunsuper ESG manager. 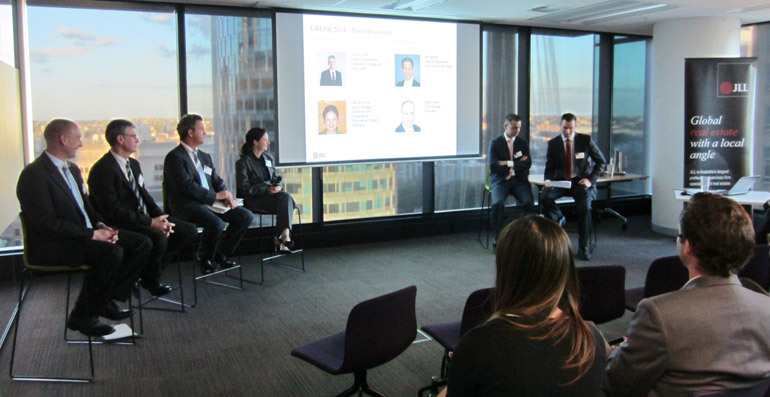 The panel was moderated by JLL sustainability director Chris Nunn. Chris Nunn: How strong is the link between ESG/sustainability performance and financial performance? Do we see increasing evidence for this? Rowan Griffin: There is a clear and demonstrated link between the sustainability performance of a property portfolio and stronger financial returns, for example the API Building Better Returns study, IPD research shows lower outgoings, lower vacancy rates, higher sales values and stronger rental returns from certified green buildings. Bill Hartnett: Valuers are not yet accounting for the “green premium” in property valuations, but there is a sound evidence base which indicates they should. Green ratings help attract and retain high quality tenants. Davina Rooney: Sustainability performance can be a proxy for quality. If you’re getting sustainability right, it’s a strong indicator that you’re probably managing everything else well too. Stuart Wilson: The link between sustainable buildings and financial returns is no longer in question. It is a demonstrated fact which investors recognise. Chris Nunn: How important is international comparability across regions? What future do you see for local green building rating systems versus global systems like GRESB? Do they complement each other, or do you think global standardisation is required to facilitate comparison between countries and regions? The GRESB survey encourages reporting in standardised metrics – megawatt-hours of energy a square metre, greenhouse gas emissions a sq m, water consumption in cubic metres a sq m, waste in tonnes & percentage to landfill etc. Will these metrics encourage standardisation that enables better international comparison? How important is international comparability? Stuart Wilson:: Sunsuper has a $30 billion portfolio with 10 per cent in property. For diversity we aim to have a majority sitting outside Australia. GRESB is the only way of comparing stock across the world. There is investor demand for globally standardised sustainability performance data, which GRESB helps to gather and disseminate. Rowan Griffin: GRESB is driving international comparability. There is national parochialism which prevents standardisation. Organisations like GRESB, CDP, DJSI, PRI and GRI are working to standardise the metrics we use to measure property sustainability performance. We’re not yet at a point where there are standardised metrics that truly enable direct international comparison, but we are making progress toward that goal. Bill Hartnett: Don’t let perfect get in the way of good. The metrics we’re using are not perfect, but they are starting to enable meaningful comparison. Asset owners are getting a lot more interested in this area. 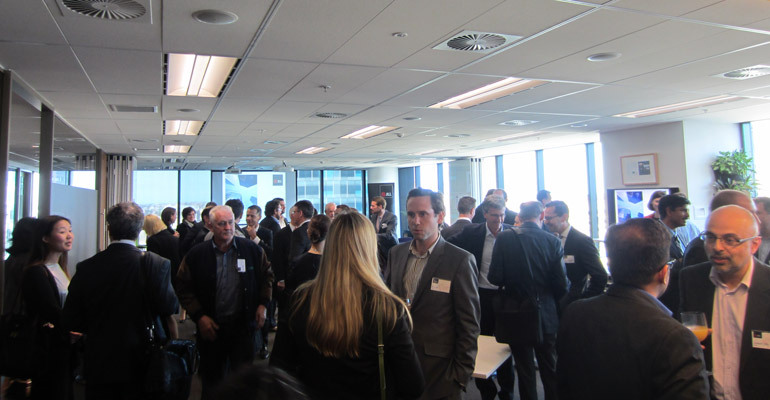 Chris Nunn: Australia leads GRESB – other regions are catching up. How can Australia maintain its leading position? What are the main drivers for further improvement? What are the main operational barriers to continuous improvement of sustainability performance over time? Are we hitting limits, or are there still lots of “quick wins”? Davina Rooney: The improvement will be in the non-office asset classes (for example, retail, industrial). We are starting to see opportunities in the “big data” that is flowing from building sub-meters and building management systems, which mean we can cut and slice this data in new ways to find opportunities for improvement. Just when you think you have seen it all you see something really exciting that can pull another 10 per cent out. There is also substantial scope to switch to renewables. This is a future opportunity for leadership. Rowan Griffin: You don’t know what you don’t know. The more you report the more you can see what to concentrate on. There is still scope for energy savings through up-skilling facilities managers. Many of the big wins have been had: Australia are leaders because we have managed our portfolios diligently since 2006-7. Most portfolios can point to 30-50 per cent energy improvements over that time. There are still significant opportunities to focus on cost savings through waste minimisation and management. Ruben Langbroek: Standing still is going backwards. There is a need to continually improve. Investors are looking for sustained performance. The only show stopper for investors is when a portfolio owner is not prepared to participate, and so there is no transparency. A participating company with poor performance is preferable to a non-participant. Bill Hartnett: The issue of climate change remains an enormous challenge. The industry needs to find ways to achieve deep emissions reductions, like 50 per cent cuts from where we are now. We need to challenge ourselves: can we be carbon neutral? Let’s keep the innovation going. Chris: How much overlap is there between your various mandatory and voluntary reporting obligations – NGERS, GRESB, CDP, GRI, ISO14001, DJSI – others? What are some of the ways you manage reporting against various different schemes? Rowan Griffin: There are a plethora of surveys that ask the same questions in a lot of different ways. A more unified and consistent approach would be beneficial. It is important that you have a really robust data management tool that produces a “single source of truth”, a database of performance data from which you draw information to respond to various surveys etc. That needs to be auditable and verifiable. Chris: How important is third party verification of reported data? Stuart Wilson: Don’t get too bogged down with independent verification. It’s a nice to have, but at this point having self-reported unverified data is better than nothing. A self-assessment still has value. Davina Rooney: Assurance is absolutely fundamental to Stockland. We are participating in advanced auditing standards like the AA1000 Accountability Assurance Standard. It includes a requirement that our sustainability reporting provides a balanced view. It’s easy to talk about what you’re doing well. But this requires you to also disclose what’s not working.